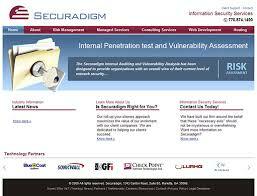 Securadigm.com was designed by Pulse Solutions in 2006, they chose Pulse to redesign the website using Web 2.0 standards. Pulse engineers gave the website that cutting edge feel that a security agency needs. Securadigm was founded by industry professionals with a vision of delivering effectively managed security services and solutions to organizations of all sizes. Securadigm has been providing services and solutions to credit unions, healthcare and internet service provider markets. Securadigm provides turn key independent and managed solutions, focusing on information technology and security, including compliance with NCUA ISTEP, GLBA, HIPAA, and Sarbanes-Oaxley. Securadigm has partnered with various companies in the United States to enable complete 24/7 monitoring of systems such as firewalls, intrusion detection/prevention, and VPN solutions, as well as staffing knowledgeable people. Pulse proves yet again that we remain the leader is custom hard-hitting web designs that leave users awestruck. Contact us today for your web design project!